Okay, I thought I'd get this off my chest. It's strictly a problem I have with game components, rather than game ruleset. 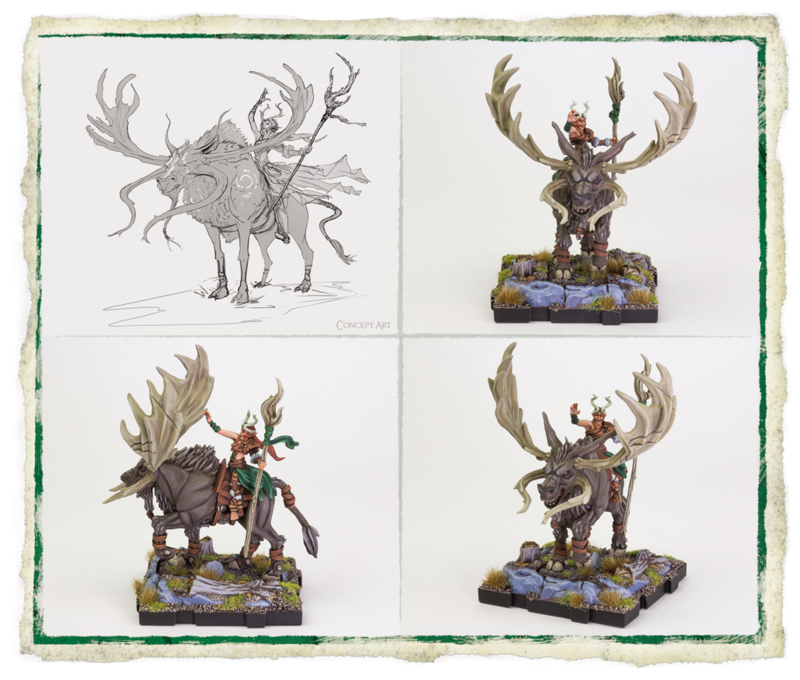 Runewars is fast establishing a unique aesthetic that helps to mark it out from its many competitors in the field of miniature wargaming. On release, this aesthetic wasn't too clear, arguably due to the skeletal features of 50% of its models. But with the new heroes and units we're seeing, there's more and more opportunities to see what the designers are aiming towards. And the answer is: cartoony. Thick facial features, oversized items, soft lines, unwieldy horns, over-exaggerated expressions, etc. Armour is simple and well designed, and most reminiscent of World of Warcraft. Whatever the reasons, I wanted to get other people's feedback on this, as it's such an important element to a game's success. And I worry about its effect on Runewars. Clearly, the game has a beautifully designed ruleset. It combines bluffing, maneuver, synergy, listbuilding, spatial judgement, risk calculation, and bundles up all these great aspects in a game that can be taken out, played, and reboxed in 2 hours. But the game falls short, in my opinion, in terms of its aesthetics. I know that this won't necessarily be a very popular thread topic, but it's nonetheless a really important one. As I've been plowing through painting my Daqan, I've been struck by how... old ... the figures look to me. They're reminiscent of 90s Games Workshop in their faces, poses and ratios. Now, painting an army is a serious commitment of time, and also of care. You're putting yourself into these little dudes, to some extent, and the end result is something important to you as a gamer. Finishing my phalanx of spearmen left me feeling a little ... cold? 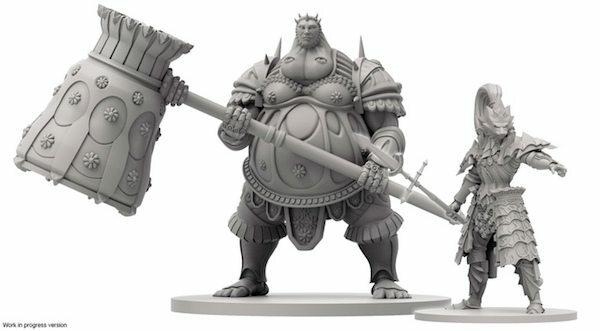 For my money, the two monster units are the only RW sculpts so far that have life, that draw the eye. Which hero would you rather spend your money on? Which would you rather spend hours painting? Which would you be proud of, bringing out at a local games night? In closing, I appreciate that this is a matter of aesthetics, and thus a lot of this boils down to personal taste. I also appreciate that many people will love this cartoony style, as well as the simplicity of sculpt lines that allow for quick and easy paint jobs. Fair enough. But I also think that aesthetics does have some objective considerations. Symmetry, elegance, skill of design & execution, refinement, imagination. I find Runewars lacking in direct comparison to its competitors, and there seems to be no reason why it should, giving the heavyweight nature of its parent company. I'm sad that such a wonderful game ruleset is not being matched in excellence in terms of its components. It would be a much easier sell down my club if the models were competing at the level of every other wargame that sees regular table time there... and in no other genre of tabletop game is component quality of such importance. Finally, please be aware that I don't say any of this out of vindictiveness or snarkishness, but out of love for the game. I want it to be a great success, but am finding it hard to overlook such a big part of what the game is. I do not agree. 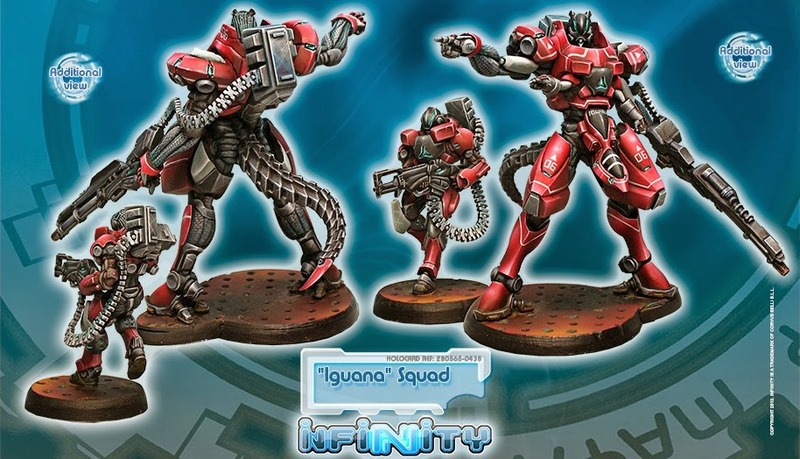 I've played infinity for years, but their miniatures are often very hard to paint. They have too thin detail for an easy tabletop paint. Citadel... they abuse quick 3D sculpting and their prices are unbereable. And IMO their games are complete ****, because they invest a lot of resources in doing miniatures, but they hire very unprofficient game designers. I quite like the runewars miniatres. They aren't a good choice for pro painter, but for a gamer like me, seeking for easy painting miniatures it's an excellent choice. You'll have to admit that this daqan colour scheme is HORRIBLE. Just like warhammer high elves, they look like barbies. Runewars boxes bring dials and cards. And what's more, play 200 points you only need about 150€ (don't know in dollars) featurig all what you need (not taking paints into account). Warhammer fantasy battles used to need about 500€ to start: more than 100€ on rulebooks, there was almost no money saving on spearheads, and they featured lots of underpowered and almost useless units. To sum up: the reason to play RMG is that whilst most games feature good miniatures but terrible rules, RMG features not so good miniatures, but excellent rules. So if you want them on the table good choice, if you want them on a shelf to practice good painting skills, bad choice. Agreed on nearly every point, druchii. But none of that really touches on my point, though - that RW minis aren't all they could be, and are below the top tier of what the market - and modern technologies - are about these days, for no apparent reason. I appreciate what you are saying and the detail and finesse are lacking compared to other minis in the marketplace. Having now painted a fair whack of Runewars miniatures, I can appreciate the speed at which I can paint them and achieve a reasonable result. My previous experience with GW armies was nowhere near as fast and the painting (while rewarding) was painstaking and slow ... almost at odds with getting an army to the table. I think they've made the right call here, and are leaning more towards inducting non-miniatures players to the hobby rather than the reverse. Because of the same reason why their rules are so good: experience and focus. They've launched dozens of good games and therefore it's logic to expect them to have a lot of knowledge about that. However they'd never produced such a big ammount of miniatures. They aren't specialized on miniature production. See that? 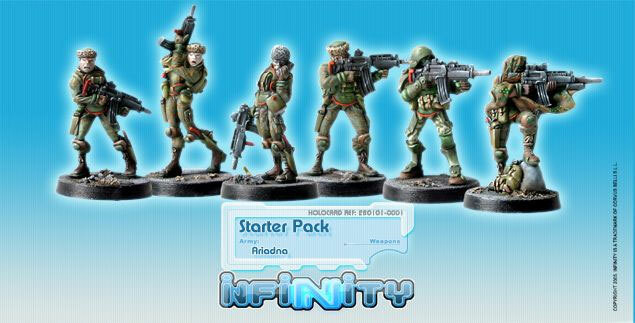 that's the awful first ariadna starter pack from infinity. Horrible. Now let's take a look into a new one. See the difference? A lot of years of experience make that. Excellent miniatures. However infinity is everything but perfect: most of their members are artist (and there's only one true rules developer) and the had absolutely no experience on game production and therefore the game is moderately unbalanced and unrealistic (unbalanced weapons, internal unbalance between troops of the same faction, external unbalance, some troops do nothing the whole game, some lists can destroy most of the enemy army in a single turn). That's logical. A company with tonnes of artists and few rule designers will probably have that profile. RMG is the way I expected and wanted. Ok, miniatures could (and should, specially the daqan) be better, but they're not the kind of company likely to do the best miniatures. Even without experience on big armies games, they've made a very simple but balanced and more or less realistic game. That's an ENORMOUS ACHIEVEMENT, probably never made before by any wargaming company (no game for 40+ miniatures was able to put those 3 key features together). Miniatures could be better? Yes, but for that you'll need to wait until they get more experience and that can take a LOT of time. They key is to look for the right p`roduct for you. I came to hate warhammer, because it wasn't for me, I like realism, I like simplicity, I like balance, I like variety, but not variety where there are only a few obvious options. And GW will never ever be the company for me. Infinity is quite decent. I'm not playing it ATM, but that's an future possibility for me, I used to like it and with a few changes I may play it again. I have never played World of Warcraft but plenty of people have, so someone must like that aesthetic. Modelling it after the cartoony aesthetic is not a bad design decision at all. You are correct the quality of FFG miniatures is not great, and only merely decent. But I can only assume that is to keep costs (sort of) down. There has been a recent change in design for most of the FFG miniatures so that they have moved towards larger details and easier to paint figures. Features are more exaggerated. You can see it pretty clearly in Imperial Assault. Figures since about Obi Wan/Inquisitor released have a blockier design but are also much more striking than some of the others. I think the cartoony aspect of Runewars could potentially hide a multitude of sins in terms of model quality. Though I do agree with you about the moldlines. I think it is a very competitive market out there, but it is pretty rare for people to buy figures "just to paint", so you the ruleset does become important in the grand scheme of things. All we can do is play the game and hope others decide to join us. That said, I am slightly annoyed about the lack of customisability. The slotted arms and pieces kills my inner creator to the point where I am going to have to chop them off and green stuff them in different poses. But my biggest complaint is definitely that the shields are attached! I hate that so much. It makes me want to learn 3d printing/design so I can make replacement arms. Good point Giraffe. RW minis are brilliant in terms of the old effort/table time ratio! Beautiful, weird, character-full minis. Zero company pedigree. Preassembled. Straight out of the gate, these minis surpass anything in the RW line. 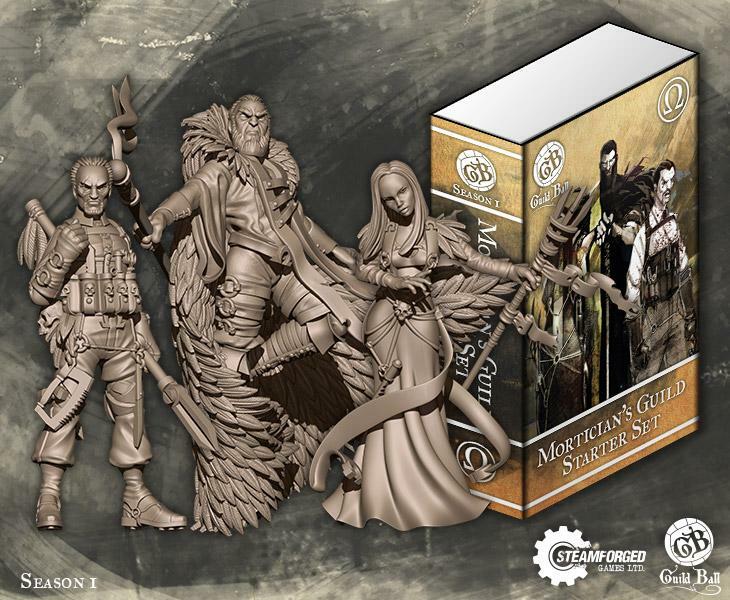 Same with Guild Ball above - very little experience, head and shoulders above RW. RW is lightyears behind this kind of model detail & fidelity, and both these games are minis-boardgames, rather than full-blown war games. IDXT - I feel you! I've been hacking my skellies up and drafting in some old warhammer weapons and banners to break up the sameness of their ranks. Interesting point on Imperial Assault, I didn't know that. Now are those renders or the real deal? Cause usually companies pretty up their stuff to make them more appealing. Even FFG does it too with the announcements/previews. I can't say for any of the other company models here, but I like the look and feel of the RW models. There are little to no errors and residue on my models at least. I have never played World of Warcraft but plenty of people have, so someone must like that aesthetic. I like the aesthetic of the Runewars. I also wouldn't have even attempted to paint any of the non-RW minis that have been posted in this thread. I've picked up a couple of those games, looked them over, and then set them back down and walked away with my money still in my pocket. I feel the designers could have gone even more cartoony, but I'm glad they didn't. Have you seen some of the art for Decent and Runebound? When I saw the video announcing Runewars Miniatures, I was thrilled with their realistic take on the sculpts. Of course, the only other miniatures experience I've had are Star Wars, so I don't have a lot of experience with minis. My point of reference may be quite different. The other thing that had me excited is that the troops look like the troops from FFG's other games, like RuneWars and BattleLore. They are instantly recognisable, which is important to me. Now, they did take a new direction with the Rune Golem, which was a pleasant surprise, but it also means that if they wanted to, they could have gone with more intricate models, and still kept true to their own Terrinoth world. Frankly, I'm glad they didn't, because like others, this is my first foray into miniature wargaming, and I'm thrilled that everything about it is so accessible. I'd rate the Runewars mini's about 6 out of 10. The game itself hovers now on 8,5 out of 10. Purely from game mechanics. The age of sh!tmar ruleset? I'd say about 4 out of 10. RW: 17 (mechanics are twice mini's IMO) + 6 = 23 / 3 = about 8 out of 10. AoS: 16 / 3 = about 5 out of 10. I've followed infinity since before it was released, played lots and lots of games and studying it a lot. I've loved it and after that love it not so much. There are clearly over and underpowered factions and often ugly metagame: order pool spam, cheerleaders, template weapons abuse, long range weapons abuse, cammo abuse, enormous lots of rules, devastating combos such as smoke + MSV2-3... that makes the game less realistic, less fair and not so enjoyable to me. They almost never solve the rule problems, they just make a new rule to try to mend the disfunctional ones. Objective missions have led the game to a disgusting and unfair speciallist spam. Is it playable? Yes. Is it enjoyable? to a certain extent, but I'm a very demanding player and I don't find infinity good enough. They look great on a shelf. And there shall they be untill I think the game is worth playing to me again. I want a game on the table, not on the shelf. Those miniatures you show are quite good. But that's not enought information. How good is that game? Is it realistic and well balanced? Does it have variety? You don't talk about it. But I bet all my money that the sculptor has made a lot of miniatures (or similar products) before. So I'm sure he has experience. They may have no commercial experience, but a naive can't do such good miniatures. Maybe you could research more about that and find out about that. But that is unfair!!! That's looks like a skirmish game (3-15 miniatures) not a wargame! 3D sculpts have a lot of advantages, but are not suitable for every game or every situation. 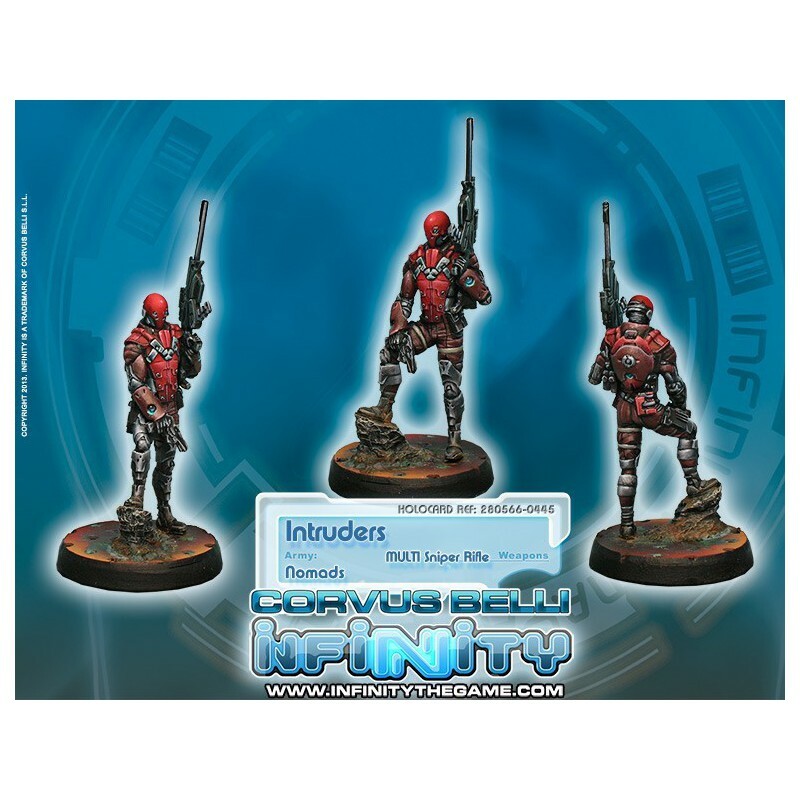 IMO this 3D sculpted intruder is worse than the handmade sniper intruder, even though it was released a few months after that. Not better nor worse necessarily. To sum up: I understand and to some extent support your criticism on the miniature quality. I think as well that you are not aware of the enormous costs of developement of 3D sculpts. It's suitable for games of few expensive miniatures or for games with enormous production rates. Good topic. I too think the material plays a factor. I too agree these models with a guide allow someone like me who is terrible at painting the confidence to sit done and paint. And I'm really enjoying the painting, I use to paint 10 years ago. Some people still won't buy in cause they aren't prepainted. I do think for you master craft painters, it is a bit of a let down. So to sum up my rambling, to my level not a big deal but I do see it being a big deal to people spending time and skill painting them. I also like these miniatures, specially the elves. Hawthorne looks a tiny cartoony. Druchii - very informative post, I really learned something, so thanks. I think I understand the reasons for your (slightly depressing!) conclusion now - namely that you can't have it all. Also, your quick summary of the flaws with Infinity game balance did bring back to me a lot of its deep problems! It still has a place in my heart, even though I don't really play it any more. Perhaps that's because it's such an ambitious game. So, Ill give an opinion from a relatively unrepresented viewpoint here. I have one game with miniatures that are painted. Thats heroscape. And as far as Im concerned, theyre painted well enough. Better than I could do. I own guild ball... and play with tokens. I cant even put those models together. The closest Ive been able to get to a rank and file game that I dont have to put together is Battlegrounds Fantasy Warfare, which while good, is hard to find or play. Now we come to Runewars. I like fantasy flight games rules (maybe not how they write the rules, but their dedication to balance and a good game). And I actually put these models together! I went out and bought myself glue and spent like 4 hours raging but I got a set together. Did I even know what moldlines were before this forum? nope. Do I care its on my models? nope. I have less than 0 interest in painting these guys, but I actually spent the time to put them together, and theyre distinguishable enough, and Ive gotten in 5 games so far with people who normally would never touch a game like this (or in one case, had never played a board game before, but went and bought a set after we played). So, this game is killing it as far as I am concerned. I'm enjoying it alot and working on strategies and hopefully one day Ill show up to worlds with an all grey army (hopefully my gluing skill improves though) and you'll be like oh hey, its that guy. This is something that I think is important to remember. These minis are going to be viewed from 4-5 feet away most of the time. There's a real diminishing return for increasing the level of fine detail in these models. If you can't see a detail (this goes for sculpting or painting) while the model is on the table it's wasted and potentially makes the model less readable which actually works against it. Simpler models with larger details seem like they'd be more visually appealing on the table. First of all, aesthetics are personal taste. For me, I love the Runewars aesthetic so far. That being said, I wanted to talk about a couple points. 1) I'm not sure if it's fair to compare fantasy games to sci-fi games. They need to address different design elements, and player taste matters a great deal in comparing across genres (even more than comparing within genres). If we do that then we can't very well compare RWMG to Infinity. And even if we did, I don't really care for Infinity's aesthetic. Like I said, it's personal taste. 2) That AoS Lord-Aquilar is $40, RWMG heroes are $25 (and includes 2 minis to use as an upgrade for different units or solo). $15 may not be a big deal if you are buying one miniature just to paint or display, but when collecting an army, it adds up. Fast. And I just wanted to point out that if you are looking for a successful minis wargame that uses a cartoony/exaggerated style, look no further than Warmachine/Hordes. I'm in fact in almost the same position, I love infinity world, and some aspects of the game, but I don't see myself playing infinity unless a good fanmade rulebook is done. The reason why I luckily tried RMG is that I've played other games from them with a friend and as soon as he gave me a link of the rulebook, I knew it wasn't just one more version of the same. I'd like to insist: the miniatures have a not too good detail, but for a tabletop level and with a decent color scheme they can be really cool. (please no more cinderella colour scheme on Daqan). 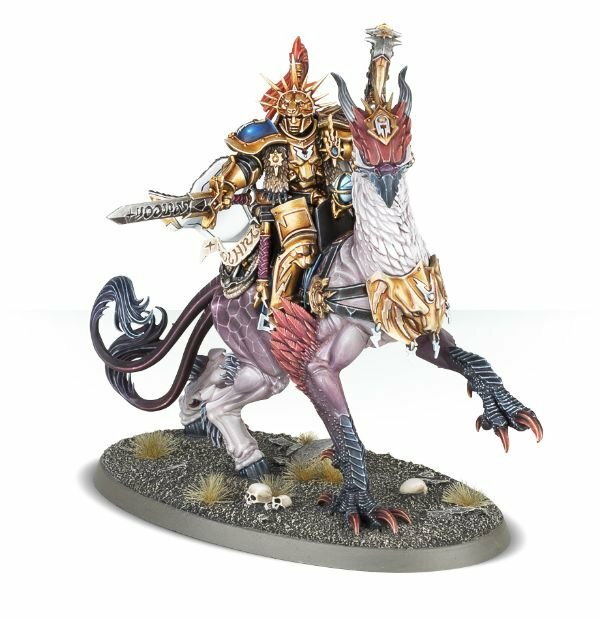 I'm pretty sure that almost everybody agree that miniatures such as carrion lancers are quite cool, and I'm sure that a better paint could make miniatures such as Lord Hawthorne or the lionx riders. Darker tones with more shades and a few powerful colour notes won't change the fact that miniatures are not too detailed, but will sure achieve an impressive aspect. I would argue that the biggest advantage the Runewars minis have over almost all other table top miniatures games is the lack of hobby time/experience required to assemble an army. Go out and buy Warhammer 40k Dark Vengeance. How long until you're playing an actual game? I'm a hobbyist by nature. I love assembling, converting, painting, etc. my models. Not everyone does. One of the reasons X-Wing is so successful is that you just open the box and start playing. Armada? Open the box and start playing. Magic the Gathering? Open the starter deck and start playing. Hell, Monopoly? Open the box and start playing. Runewars requires a little bit of prep work, but not much. You and a friend can open the box, spend 15 min gluing models and punching tokens and then be ready to play a game. As such, the barrier to entry for new players is pretty low. Warhammer 40k has a pretty high barrier to entry in terms of time and money. Something like Infinity has a pretty high barrier to entry in terms of sheer hobby experience required. Hand someone who has never assembled a model before an Infinity starter set and laugh as they glue their fingers together and curse when the fiddly metal bits keep breaking apart. TL:DR; Runewars is nice because it has a low barrier to entry and requires minimal hobby experience. Everyone knows I'm a big FFG fan boy, because... reasons, but I'm actually going to be the one to agree with you somewhat. I will disagree a little bit about the aesthetic of GW minis. Although you are right that they have a lot of detail and are quite varied, I kind of feel that they fall a bit too far to the other end of the scale from RWM. Looking at GW the last bunch of years, it almost seems like they keep adding more detail just for the sake of details. To the point that some of their sculpts just look silly, and could use to actually be less detailed to look normal. That being said... i do wish the RWM minis were a bit better. On my scale of detailed to simplicity, neither company hits the mark for me. One is sometimes too complex, the other too simple. No one is just right. I think the thing that gets me a good bit is that looking at the carrion lancer and runegolem, it kind of makes the plainess of the basic guys even more pronounced. In the end I think they decided to lean more towards inclusiveness and getting non-wargamers into the hobby with more simple sculpts and more focus on the rule set, and although it's not my goldilocks of the miniatures world, I think they did ok. I will be doing a bunch of conversions to pretty up some of them though.